Without a doubt, cruising offers one of the greatest values in vacations. You can have an entire vacation, complete with room, food, entertainment, and more, often for less than airfare alone if you were to fly to the destinations you’ll visit on your cruise. But just because there is great value doesn’t mean there aren’t some major rip-offs in cruising. From what you drink to where you park, the opportunity to spend more — sometimes much more — than you have to is constantly present on a cruise. After all, they cater to a captive audience who is looking to let loose and have a good time. Still, by recognizing the potential bad deals, you can avoid them, save a bundle of money, and be a smart cruiser. Head to a grocery store, and you can pick up a 12-pack of soda for $3-5. On a cruise? You’ll pay three times as much! Royal Caribbean currently offers a 12-pack of Coca Cola for $28. That’s $2.33 for a can of Coke. Our advice? Some cruise lines allow you to bring on a 12-pack of soda for free. Take advantage and save yourself the money. Royal Caribbean doesn’t allow you to bring on soda, but their unlimited soda package is a good way to save some money during your trip if you are an avid soda drinker. Do you drink Jack? Or for that matter, any other liquors like vodka or rum? Prepare to pay a ton of money for them once you are on the ship. A liter of Jack Daniels will run you about $25-30 on dry land. In Carnival’s Fun Shops (where you can buy items to have them waiting for you in your stateroom), that same bottle runs $85! It’s the same story for most other bottles of popular spirits. A 1-liter bottle of Captain Morgan runs $85. A liter bottle of Grey Goose vodka is a staggering $105! No wonder nearly 20% of passengers admit to trying to sneak alcohol aboard the ship. One of the nice things the cruise lines do is let you bring on some alcohol in limited quantities. Most cruise lines allow a bottle of wine or champagne for each guest. While that amount is unlikely to get you through a 7-day cruise, it is an easy way to save a few bucks versus buying wine or champagne once you are on the ship. One of the nasty things they do? If you want to drink the your wine in a public place on the ship — like the dining room — then you’ll be hit with a corkage fee. This charge is simply a fee to consume your wine, that you brought on board. Costs vary by cruise line, but can range anywhere from $15 to $30. If you want to avoid the fee, then simply pour your drinks in your cabin and avoid drinking your wine or champagne in the bar or dining rooms. 6-to-5 payouts are common in a cruise casino. If you want to gamble, go to Vegas. There’s nothing wrong with spending a few bucks in the ship’s casino, but if you are betting big, then you have much better payouts in land-based casinos. With a captive audience on the ship, there is little incentive for the cruise lines to give players much advantage. That’s why you’ll find craps tables with 1X odds bets (instead of the typical 3X-4X-5X) and blackjack tables that pay out 6-to-5 on blackjack (instead of the regular 3-to-2). You’re better off hanging on to your gambling dollars until you can hit a regular casino. At home, if you’re paying more than $50 a month for Internet, then you are likely getting a bad deal. At sea, decent Internet costs so much more. Considering that even budget hotels offer wi-fi for free, the cost on a ship is a total rip-off. For example, Norwegian Cruise Lines offers onboard wifi at a cost of $30 a day for most cruises. You might complain about a $50 Internet bill at home, but a month of the ship’s service would cost $900! For that reason, it’s best to just stay off the Internet while on your cruise. If you really need to check email, most ports will have Internet cafes that you can use for cheap. If you drive to your embarkation port, then you’re going to have to find a place to park your car during your trip. Every port offers parking, usually right at the terminal. But that convenience comes as a big price. We’ve seen some ports charging $20 per day for parking. That’s $140 for a 7-day cruise, before you even step on the ship. You can get much cheaper parking by looking for off-site parking lots that are independent of the port. It’s not unusual to find prices that are as much as 50% cheaper and nearly as convenient to the port. 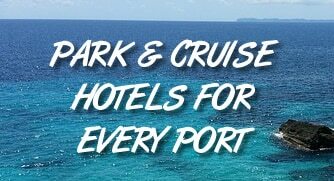 In addition, if you are planning to stay in your port city the night before, then look for a hotel with a park and cruise package. These packages can give you discounted (and sometimes free) parking with a one-night stay. That’s a much better deal than shelling out $20 a day for parking. If you’ve never cruised before, you might be surprised at the onboard art auctions. It’s rarely discussed in brochures or websites, but the auctions are advertised heavily once on the ship. While they are a great place to find some new artwork, you should be sure to buy only if you actually like and want the piece. There are a number of articles detailing dubious valuations for artwork that are then found to be worth much less after passengers spend thousands of dollars. There’s nothing wrong with buying a piece simply because you like it. But don’t think you’re getting an awesome deal. Let’s be clear, some insurance is better than no insurance. But the stuff sold by the cruise lines isn’t all that great when compared to other options. You’ll have the ability to add insurance when you book your ticket. It’s easy and convenient. However, coverages are limited and the price is high. For example, Carnival’s coverage offers up $10,000 for accidental medical expense. A middle of the road plan from Allianz offers $25,000 in coverage. The cost of cruise line insurance is typically high as well. Carnival charges $129 per person ($258 total) for a cruise that costs about $3,000. The aforementioned Allianz plan offers better coverage and costs $214 total. We’d recommend shopping around for travel insurance with a site like Squaremouth.com (which searches 20+ insurers at once) to find all your options before buying what the cruise lines sell. Note: We are an affiliate of Squaremouth and receive a small commission if you purchase insurance through the link above.